The current paksha (fortnight) is Sukla Paksha (benefic, beginnings) and this will continue for two days. The current year is 1939 Hemalambi, Shaka Samvat. Those born in this year will seek home comforts, seek to collect suwarana (gold), have comfortable conveyances (transport, cars, etc.,) and it is the year of the 6-fold disasters. It is also the year of timing important events properly. On day of Ugadi (a movable date, based on the lunar calendar)(Sunday, 18 March 2018) will commence the Vedic New Year. It will begin on a day called Pratipada, in the month of Chaitra, with Shukla Paksha, and the year will be 1940 Vilambi, Shaka Samvat. Those born in the coming year called Vilambi will be bound by the senses, bound by their desires and perhaps, will need to develop the habit of gathering thoughts together before speaking. Raising such a child presents challenges. The challenges of the year 2018 appear to be many. Our world is at a junction; artificial intelligence is taking over many human tasks and thus, proper human activity called work will change; jobs will disappear, and Universities are training graduates for jobs that do not exist at the time you read this. The future is more than uncertain; as the Earth sloughs off the skin called the Industrial Revolution, and the new skin of the Technological Revolution emerges, survival with sanity may be a matter of risk for many. Moreover, the Sixth Mass Extinction Event – the Holocene event, is in progress. Our world is changing in ways never seen before. The real challenges that confront humankind is verily human life itself. We have children, both parents have to work, how do we raise a good child? “Good”, meaning morally good child with meaning and purpose and self-confidence that goes beyond the day-to-day humdrum of life? The broadcast media puts out crime and violence; the visual media puts out violence and people as objects of desire; social media disconnects from immediate day-to-day interactions of family, friends, culture and spirituality. The challenges that sit before us are moral: the survival of the family, the society, the culture, goodness, beauty and truth. Some say human advance is they make their nuclear bombs; Some say human advance is they acquire their digital currency; others say human advance is they can have their cake and eat it too. True progress as human beings, society, culture and nation depends on the development of the five human values within: Truth, Love, Peace, Right Conduct and Non-violence. 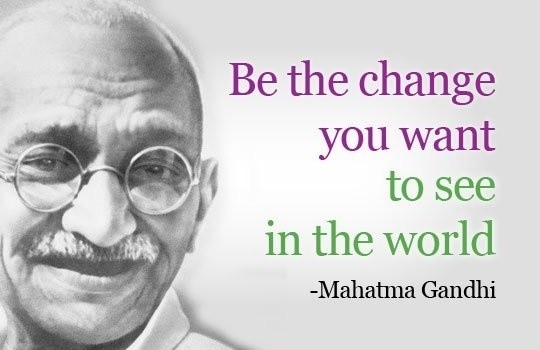 As Gandhi told, “Be the change you wish to see in the world”.